I am very worried about having to undergo stitch-removal. Why do stitches have to be applied and then removed again? When do stitches have to be removed? Does the removal of stitches require local anaesthesia? 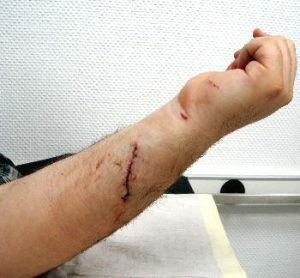 During surgery or after an injury the skin and many times also the below-lying fat will tear. As long as the wound is not sealed, bacteria may enter in depth unhindered and lead to severe infections. By keeping the skin edges tightly aligned against each other sutures after only a few days will keep bacteria from penetrating into depth. Only after the discovery of skin sutures modern surgery became possible. The skin suture seen on the deep wound creates the precondition for a fast and uncomplicated recovery. Six days lay between the image above (fresh injury) and the second image above (changing dressings).The applied suture made the rapid recovery possible. Wound care may be carried out with sutures or surgical staples. However, stitches are foreign objects and therefore must be removed! Yes. Self-dissolving stitches or absorbable sutures are usually used in structures located deep in the body, for instance intestinal sutures, tendon sutures….. Removing the stitches may vary depending on which area of the body is contemplated. Stitches to eye lids are usually removed after 5 days, stitches on the neck typically after seven to nine days and stitches applied to feet or hands mostly after twelve to fourteen days. No. The anaesthesia would be much more painful than the actual stitch removal process. In order to remove the stitches one requires a pair of tweezers and scissors (or in lieu of scissors a sharp scalpel). The tweezers are used to slightly lift up the knot of the suture from the skin. The thread loop which then becomes visible will then be cut with the scissors or the scalpel. After doing so the stitch can easily be pulled from the skin! 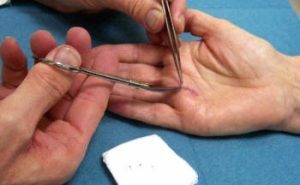 Removing stitches from a properly healed wound is usually very simple and does not inflict more discomfort than a slight pulling sensation. 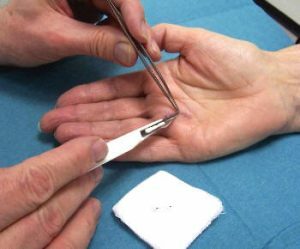 Using a disposable scalpel has proven to be the most gentle approach particularly for stitch removals on hands.